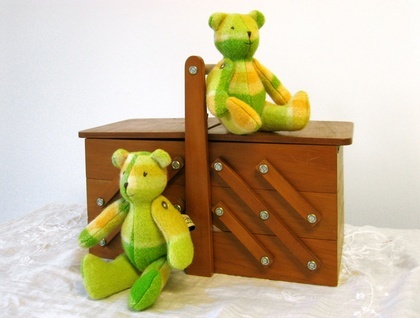 Once there was a Blanket Bear who was hand crafted from a vintage NZ wool blanket, in wonderful colours of green and yellow. Small Blanket Bear is made from a carefully laundered 100% wool vintage Blanket, he is carefully cut out and handcrafted with a hand embroidered face , he has vintage buttons that joint his arms and legs. He is fully posable and can sit or stand ( with support). Because he is handmade and contains small parts ( buttons) he is suitable for children over 3yrs, or could sit on a shelf overseeing the nursery. He is quite fond of sitting on beds ( must be because of her blanket origins). More Blanket bears available in different colours(blankets) Please enquire if you have a special colour request. 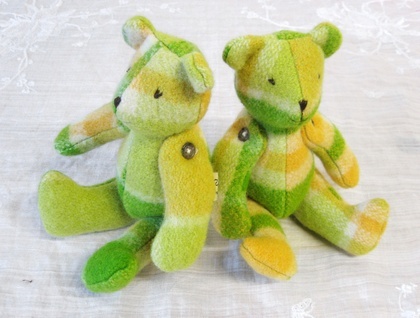 Blanket bears can also be custom made from your own special memory blanket.